Customizing a fire truck is more common than many people might think. 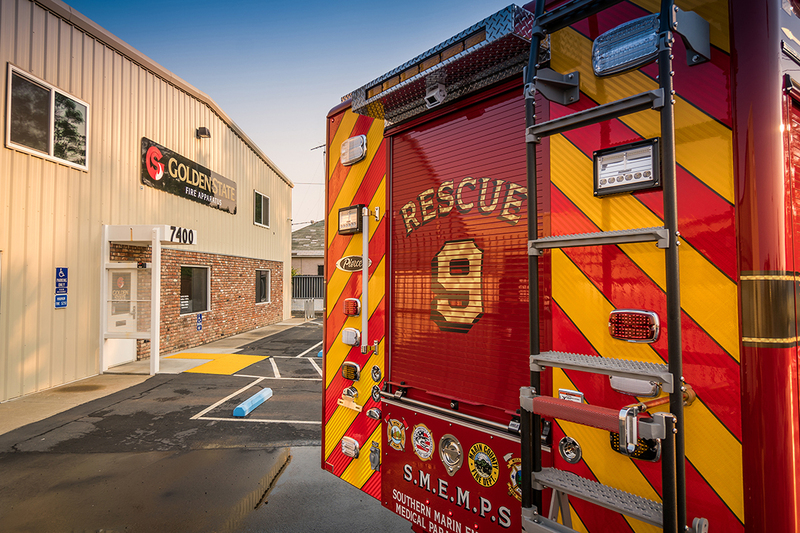 Roughly half the emergency vehicles sold each month by Golden State Fire Apparatus have had modifications made at the company’s 35,000-square-foot shop in Sacramento. “There are lots of things we do here after the rig is delivered,” said Jason Dinkel, GSFA’s operations manager. Among the most popular modifications are improvements to specific compartments, secure mounting of tools like axes or the Jaws of Life, and upgrades to radio systems. Customization is the final part of a process that often takes up to 18 months. GSFA experts work closely with customers to learn how vehicles are expected to be used and what add-ons will make them even more efficient. They discuss what options make the most sense, Dinkel explained, and often travel together to the Pierce Manufacturing factory in Appleton, Wis., to meet with the company that builds the truck. Members of the Southern Marin Fire Protection District made that trip earlier this year. They are part of a Joint Powers Authority known as Southern Marin Emergency Medical Paramedic System, or SMEMPS. It ordered a one-of-a-kind rescue vehicle to serve a chunk of rugged headlands and small towns with more than 60,000 people just north of the Golden Gate Bridge. The vehicle, known as Rescue 9, is a heavy-duty apparatus built on an Arrow XT chassis. It is built to safely maneuver in the narrow and challenging topography from sea level to the 2,500-foot peak of Mount Tamalpais. When it comes on service in September, it will replace a worn and aging 2003 Pierce Dash rescue. Martinez was part of a committee that assessed the agency’s needs for the vehicle. The members wanted to increase storage while minimizing the effects of an overall size increase. To achieve that, Martinez said, they customized Rescue 9 with the Oshkosh Tak-4 T3 rear independent suspension that provides mechanical rear steering for reduced steering radius. Working with Golden State, he said, has been a rewarding process. 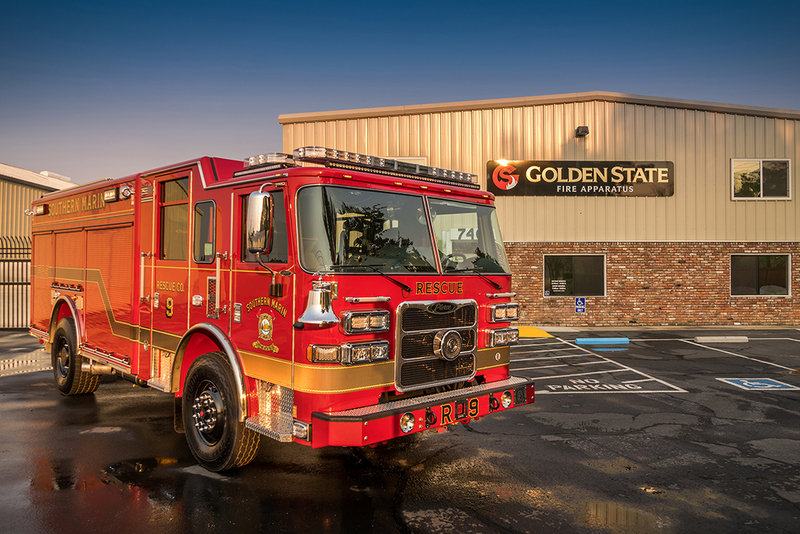 “Golden State Fire Apparatus was an advocate for our needs and accommodated our detailed interaction with Pierce Manufacturing,” Martinez said. “A pre-build meeting with a Pierce rescue division engineer allowed us an early conceptual design to begin the process, thus providing us a solid foundation to begin the specification process. Before Rescue 9 is put into service, it will have a 250-item pre-delivery inspection, or PDI, that every vehicle (modified or not) undergoes before its owner takes delivery, Dinkel said. Golden State has three full-time employees devoted to customizing fire and rescue vehicles in whatever way their customers need to have happen.